Idyllic landscapes, scenic routes and low traffic on the narrow roads between mountains, villages and the sea – during low season the Cilento National Park is a paradise for cyclists. 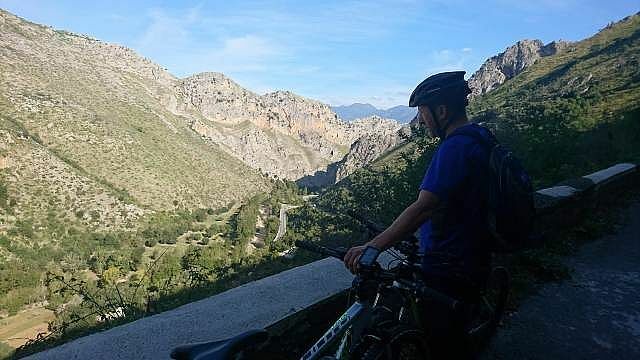 During our guided cycling holidays Bicimania Moretti, bicycle experts from Marina di Camerota, provides you with high-quality e-bikes, which enable you to cope with inclines and even long serpentine roads easily and in almost no time at all. This leaves you with more time to enjoy panoramas, cultural highlights and the fantastic Southern Italian cuisine. The six varied tours of this cycling holiday have been planned for you by cycling enthusiasts family Moretti and take you from Paestum in the north as far as Monte Bulgheria and Infreschi bay on the southern Cilento coast. You are guided and accompanied on the day tours by Francesco Moretti and his girlfriend Valentina, both FIAB (Italian bicycle federation) certified guides and MTB trainers. Your holiday, of course, does not only include the experience of cycling, but also other delights and treats. You get to know small enterprises off the route, taste the irresistible buffalo mozzarella and cool off in the turquoise blue sea at solitary bathing bay. During your cycling holidays, you are accommodated at Hotel Calanca in Marina di Camerota. Andrea Bifulco runs this seaside hotel with 20 rooms and pool in a very warm-hearted and charming manner. When not on tour, you are sure to feel at ease there and to enjoy its very good Cilentan cuisine. The hotel is only a ca. 5-minute walk from the center of the fishing village, which is said to be the sunniest in the Cilento. On your first tour you get know one of the Cilento’s landmarks – the Cape of Palinuro. The road from Marina di Camerota to Palinuro runs parallel to fantastic, long sandy beaches. Before entering the town, however, you turn off into the Mingardo valley and follow it up to the abandoned mountain village of San Severino. Impressive rock faces line the river of the same name. Then, resting clearly visible enthroned on the plateau, there is San Severino with its abandoned houses and squares. Passing silvery-green olive groves, the road continues on to Centola. In the narrow alleys of the village, time seems to be standing still. At Palinuro, which was once considered the tourist hotspot of the Cilento coast and stretches out at the foot of the beautiful cape, you meet with a completely different atmosphere. You ride your bikes easily up onto the back of the majestic headland, which was already described in Greek mythology. On the southern side of the cape, you come across the rock arch Arco Naturale, behind which a truly idyllic bathing bay lies hidden and where you should go for a swim in the still warm waters of the sea before returning to Marina di Camerota. You have to get up early today, because the train you are taking to famous Paestum in the north of the Cilento departs from Pisciotta-Palinuro station at 7.55 h. Before you get to admire the world-famous temples, you are scheduled for a surely interesting guided tour of a local buffalo farm. Early in the morning, the cheese-makers deftly form the small, snow-white mozzarella balls, which are ready for tasting shortly afterwards. After this culinary treat you ride your bikes to the remains of the old Greek town, a UNESCO World Heritage Site. Its three Doric temples count among the best preserved of their kind in the world and, to this day, they make for a very special magic atmosphere in this place. The adjoining museum is home, amongst others, to the “Tomb of the Diver”. The tomb slab is regarded as one of the most important monuments of antique artistry. In the afternoon, you 'dive into' the wild-romantic beauty of Punta Licosa, the northern-most point of the Cilento coast, where a small bathing paradise and the island of Licosa lie 'hidden' behind pines bent by the wind. After giving yourselves and your bikes a short break in this place, Francesco and Valentina take you on to Castellabate and Agropoli, from where you take the train back to Pisciotta-Palinuro. A scenic road along centuries-old olive groves runs through the Mingardo valley up to the mountain village of Licusati. You stop there for a visit to a historic oil mill, which has been turned into a museum, and, of course, for more information about the long tradition of olive cultivation in the Cilento. You then continue on to the neighboring village of Camerota, which is known for its old art of pottery and where you stop at one of the workshops and maybe have a go at shaping some clay yourself. On your bikes again, you let them roll ca. 3 km downhill back to Marina di Camerota. On day 5, your bikes are off and you are going on a hiking tour to explore the maritime wildlife park of Infreschi south of Marina di Camerota. From Lentiscelle beach you make your way up to the Cilento’s probably most beautiful coastal hiking trail. Panorama at its best from the first to the last kilometer is guaranteed. There is a first break at Pozzallo bay with enough time to have a bite to eat and even for a swim in the sea. Then on you go through lush Mediterranean macchia and always accompanied by the sounds of the sea to Cala Bianca bay, where you arrive shortly afterwards. Should you be in the mood, you can take another plunge into the turquoise-blue sea. Destination of the coastal hiking tour is Porto Infreschi, a natural harbor the old Romans already cast anchor at. It counts among Italy’s most beautiful bathing bays. You are picked up there and taken back to Marina di Camerota by boat. There are several impressive sea grottos along the way back, which are definitely worth a closer look provided the sea is calm. 'Cilento coast there and back' could be the heading of this day’s tour. On your way lie cultural highlights such as the excavations of Velia, another town founded by Greek settlers and from where the teachings of the Eleatic School spread out. After a guided tour of the site, you continue on along the coastal road to Acciaroli, one of the most beautiful and 'harmonious' towns in the Cilento. During one of his stays there, Hemingway is said to have been inspired by a local fisherman to write his story about “The Old Man and the Sea”. Stories about Cilentan diet and an American by the name of Ancel Keys are told at Pioppi. The small seaside town is simply charming and today appeals very much to dieticians. Inspired by Ancel Keys’ guideline “Eat well and stay well”, they carry on his studies on the Dieta Mediterranea. On the last day of your cycling holiday, you are on a tour around Monte Bulgheria, which 'separates' Marina di Camerota from the Gulf of Policastro and where, once more, you meet with breathtaking panoramas. On your way through the villages around Monte Bulgheria, you come across old wells, ancient portals, chapels and pilgrimage churches. Roccagloriosa awaits you in the late morning for a short and historically interesting guided tour of the village. At San Giovanni a Piro, shortly before the end of this circuit tour and of your journey through the Cilento by bike, Francesco and Valentina once more offer you an unforgettable view of the Gulf of Policastro. Changes to tour program possible due to weather conditions. Shared transfer service from/to Naples airport or main train station. 15 Euro p.p. if the day of arrival/departure is Saturday. For other days of arrival/departure please ask for an individual offer. Bike helmet can be brought along, but can also be provided by Bicimania Moretti. All guided tours are in English. This tour offer is, unfortunately, not suitable for persons with mobility impairment. Should you have any questions about this, please contact our customer service. Der Cilento hat mich in vielerlei Hinsicht begeistert. Besonders toll fand ich die interessante Kultur und die wunderschöne Natur. Und auch das gute Essen habe ich sehr genossen. Zudem gibt es dort sehr viele tolle Möglichkeiten zum Wandern, Mountainbikefahren und Baden. Einziges Manko: Die Beschilderung mancher Wege könnte verbessert werden. Im Hotel Calance habe ich mich überaus wohl gefühlt. Die Inhaber sind sehr nett und familiär und kümmern sich gut um ihre Gäste. Definitiv ein besonderes Erlebnis war für mich, als ich einen Tag bei der Olivenernte in Felitto, bei Marco Rizzo, mitmachen durfte. Außerdem war der Besuch der Wasserbüffelfarm auf jeden Fall eine interessante Sache. Alles in allem: Jederzeit nochmal! Sowohl das angenehme Klima als auch die wunderschöne Gegend und die netten Menschen haben mir sehr gefallen. Gerade die Angestellten des Hotels sind alle ausnehmend freundlich und aufmerksam. Ich wurde eher als Freundin statt als Gast aufgenommen. Schade fand ich nur, dass im Oktober bereits viele Restaurants und Hotels schließen und nur noch wenige Gäste da sind, obwohl der Herbst doch die beste Zeit für Aktivferien wie Biken und Wandern ist. Dafür waren die E-Bike-Touren und die Küstenwanderung mit Familie Moretti einzigartig und bleiben unvergesslich. Ich habe definitiv einen schönen Einblick in die Gegend bekommen. Wiederkommen möchte ich auf jeden Fall – zum Wandern und Radfahren, eventuell Oliven ernten etc. und um den warmen Herbst zu genießen!